Preschool is an opportunity for children’s growth, their first experience in a structured setting with teachers and groups of children where they learn to share, follow instructions, and begin the foundation for learning that will occur in the upper classes later in school. It promotes social and emotional development. Young children learn social skills and emotional self-control through their experiences in school with the help of their teachers who help them manage frustrations and anger. They help children work out their own problems and encourage them to notice the impact of their aggressiveness towards other children. Children are encouraged to make their own choices where they choose activities of their interest. Teachers suggest to the children ways to figure out how to join other children’s play or groups. Children learn how to take care of themselves and others. They are offered chances to help out in the classroom, keeping their personal belongings, putting away the toys, cleaning up after snacks, etc. They are also encouraged to assist their peers and offer help when needed. 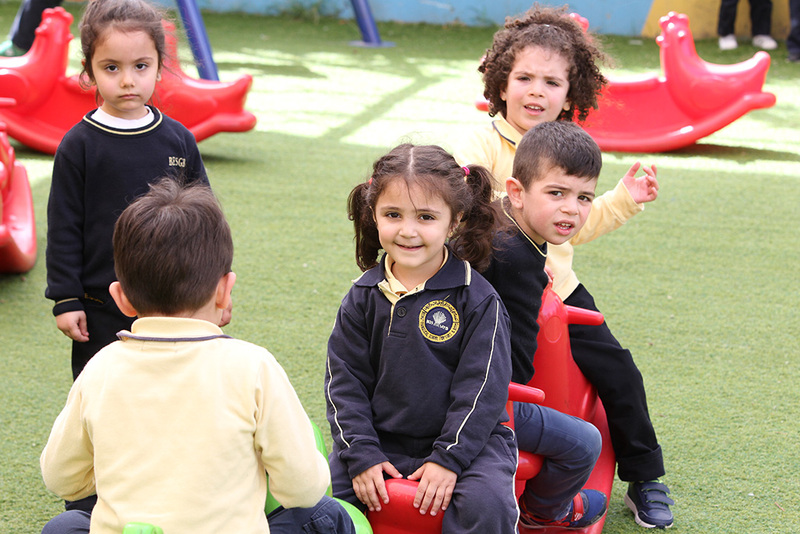 In our preschool, we celebrate diversity and encourage tolerance and acceptance of others. Three languages (English, French, and Arabic) as well as cognitive skills are promoted at the preschool level. Language skills are nurtured in a language rich environment. In a conversational manner, teachers help children practice their language skills. A young child’s cognitive skills are strengthened by engaging in a wide range of hands on activities which challenge him to observe closely, ask questions, and solve problems. Many other subjects are also taught to our preschoolers, such as Math, Art, Christian Education, and Music. Since physical coordination is very important at this age, Rhythmic periods are given to strengthen it through playing active games and a variety of activities to build up hand-eye coordination and develop their fine motor skills. Technology in our preschool comes to facilitate the teaching process and make it more appealing. Every class is equipped with LCDs, computers, DVD players, iPads, CD players, and projectors as well as interactive boards in the KG3 classes. Our classes are organized in a way to promote and facilitate learning. In each class there are centers designed for reading, playing, and technology application. This layout helps in developing the interest and creativity of the preschoolers. Our play area is well equipped and safe. A supervisor and several assistants are always around to watch over the preschoolers and maintain safety in the playground. Finally, we believe that parents play an important role in the early years of their children’s lives. Hence, we seek to maintain a close relationship with them to ensure the physical and mental welfare of our preschoolers. When you, parents, choose a good quality program that suits your child, you will be sure that your child is well cared for, is enjoying school and making friends, as well as gaining knowledge, skills, and confidence to do well later in life.